you don't have to be a religious person to know that - when you see a story about the lucifer telescope next to the vatican's observatory - things are getting biblical. and you don't have to be a christian to be concerned about 'clergy response teams' & microchip implants. you just have to know that these stories, signs & symbols are being used for a reason. are we being prepped for some kind of space event, a holy happening or even a fake rapture? is this the end of days or only the beginning? 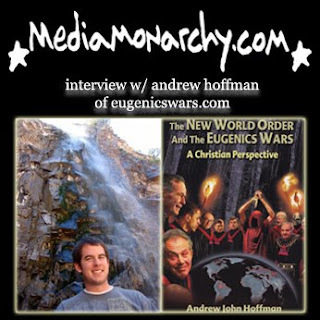 the latest special interview episode from media monarchy is a great introductory conversation with andrew hoffman, author of 'the new world order & the eugenics wars: a christian perspective'. As the globalists continue to move their nuclear football down the field, your assistance in spreading this information becomes increasingly vital; help your friends & family make informed decisions about their lives. 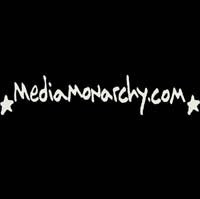 Subscribe to the feeds from Corbett Report here & Media Monarchy here. Thank you. 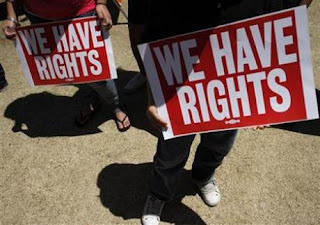 from reuters: Hispanics and Democratic lawmakers furious over Arizona's harsh crackdown on illegal immigrants expect huge weekend rallies across the United States, piling pressure on President Barack Obama to overhaul immigration laws in this election year. Protest organizers said on Wednesday outrage over the Arizona law - which seeks to drive illegal immigrants out of the state bordering Mexico - has galvanized Latinos and would translate into a higher turnout for May Day rallies in more than 70 U.S. cities. from washington times: The U.S. military has canceled a major field exercise that tests its response to a nuclear attack, angering some officials who say that what is now planned for this month will be a waste of time. 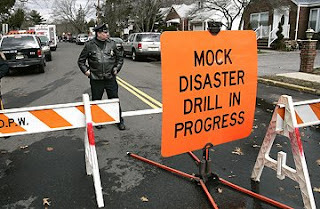 U.S. Northern Command in Colorado withdrew from major participation in this month's National Level Exercise (NLE), a large-scale drill that tests whether the military and the Department of Homeland Security can work with local governments to respond to an attack or natural disaster. The exercise was canceled recently after the planned site for a post-nuclear-attack response — Las Vegas — pulled out in November, fearing a negative impact on its struggling business environment. A government official involved in NLE planning said a new site could not be found. The official also said the Northern Command's exercise plans for "cooping" — continuity of operations, during which commanders go to off-site locations — also had been scratched. "All I know is it's been turned into garbage," said the official, who asked not to be identified because of the sensitivity of the information. "It's a nonevent." The NLE, which is supposed to be a series of hands-on exercises to test the system in the event terrorists use a nuclear device, has become instead a "tabletop exercise at best," the official said. Maj. Michael Humphreys, a Northern Command spokesman, said the military officials decided to delink the Ardent Sentry exercise from the National Level Exercise, but he stressed that the command conducts other exercises and "cooping" at other times. 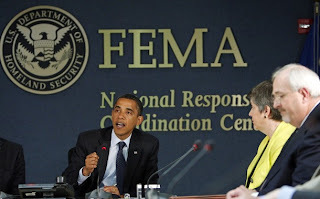 why is fema trying to cover up national level exercise 2010? 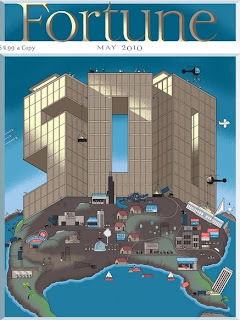 from huffpo: When Fortune magazine asked comic book artist and Oak Park resident Chris Ware to design the cover of their "Fortune 500" issue, they were probably not expecting his "beautiful and Marxist" interpretation of modern capitalism. 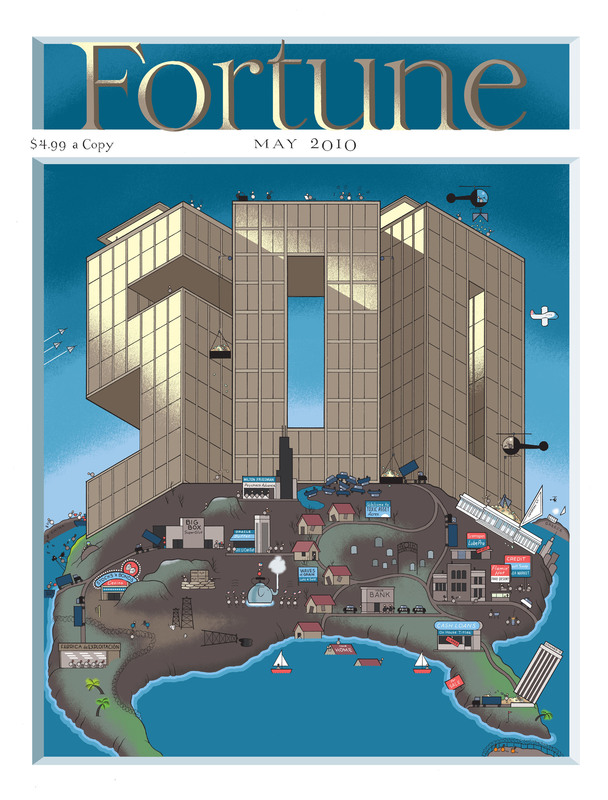 Chicagoist reported Friday that Ware was asked to design the May cover of the magazine, but his final product, which featured "Guantanamo Bay prisoners, Mexican factory workers, and a few potshots at business execs and money-grubbing politicians" was apparently not what Fortune had in mind--they killed the cover. Still, a high-resolution version of the Ware cover is making its rounds on the Internet - and fans are delighted. from nytimes: Amid mounting frustration over taxation and banking problems, small but growing numbers of overseas Americans are taking the weighty step of renouncing their citizenship. from raw replay: CBS' Leslie Stahl talked with Pakistani students in Pakistan’s Swat valley. One student told Stahl that the US attacked itself on 9/11 as excuse to go to war with Muslim countries. 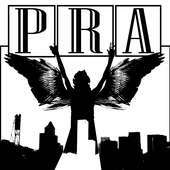 This video is from CBS’ 60 Minutes, broadcast April 25, 2010.
support ground zero & purchase this episode! from clyde lewis: My show has taken on this heavy cloak of responsibility lately. The responsibility has been firmly planted in the worry that I could very well have to become unpopular and call out disinformation even when it offends the very audience that wants to believe in the prevailing theory instead of the compelling evidence to the contrary. It used to be that the speculation surrounding the story helped produce thought forms leading to the educated guess. Now the speculations are loaded with disinformation that can create a schism and the snag will kill any and all serious investigation and intellectual honesty about what really is happening. The art of disinformation is there to fine tune your paranoia. from corbett report: The Corbett Report is pleased to present the audio of Alex Jones' latest documentary, Police State 4: The Rise of FEMA. 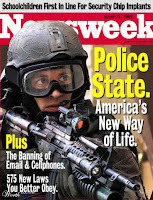 In this detailed dissection of the police state, Jones breaks down the incremental implementation of martial law and how we are being conditioned to accept an ever-expanding police and military role in our daily lives. 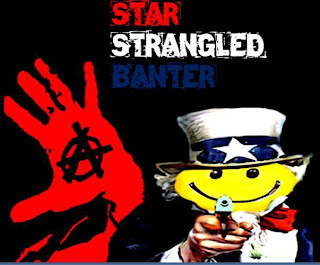 If you enjoy this documentary, please support the filmmaker by buying the DVD at Infowars.com or downloading the high quality video at PrisonPlanet.tv. from popsci: A new instrument with an evil-sounding name is helping scientists see how stars are born. 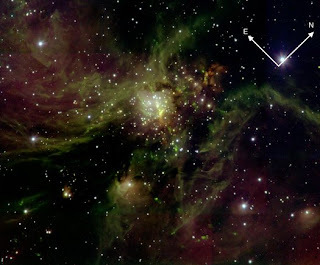 Lucifer, which stands for (deep breath) "Large Binocular Telescope Near-infrared Utility with Camera and Integral Field Unit for Extragalactic Research," is a chilled instrument attached to a telescope in Arizona. And yes, it's named for the Devil, whose name itself means "morning star." But it wasn't meant to evoke him, according to a spokesman for the University of Arizona, where it is housed. 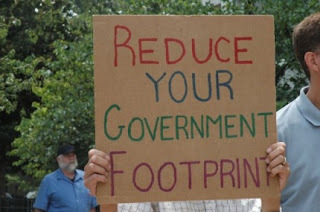 Story#1: Why is FEMA Trying to Cover Up National Level Exercise 2010? Please support the New World Next Week by sharing, rating, commenting & promoting these videos on YouTube & your own social networking site; NWNW is getting thousands of views, but with your help they could be seen by even more people who need this information. 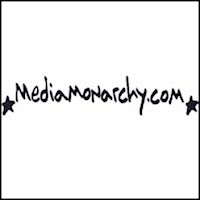 Stay up-to-date by subscribing to the feeds from Corbett Report & Media Monarchy. Thank You. from philadelphia bulletin: Today is Earth Day, a holiday created to honor the planet and to raise the consciousness of man’s effect on the environment. Philadelphia has a very strong tie to this day. One of its native sons, Ira Einhorn, was a co-founder of the environmentalist jubilee. But Mr. Einhorn has another line on his resume. In addition to being a environmental guru, he is the Unicorn Killer. While a student at the University of Pennsylvania, Mr. Einhorn dated a Bryn Mawr College graduate by the name of Holly Maddux. When the affair ended in 1977, Mr. Einhorn went into a jealous rage and murdered her. 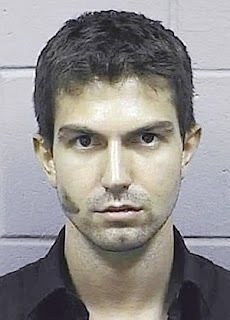 He concealed his crime for 18 months by stuffing Ms. Maddux’s body in a trunk that he kept in his apartment. The foul odor of the decomposing corpse coming from Mr. Einhorn’s Powelton Village apartment caused neighbors to complain. In 1979, police found the trunk stored in a closet in Mr. Einhorn’s apartment. 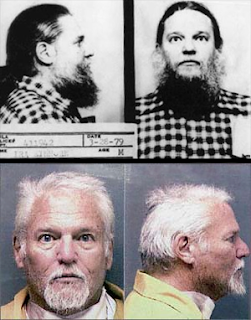 Ira Einhorn, member of the counterculture pantheon, one of the founders of the environmentalist movement, icon of the liberal intelligentsia, was charged with murder. from time: When Joanne Chavarria's grandmother died last summer, she coped by turning to the bottle. "I started to drink. And then I started to smoke some weed. And then I started doing meth," says the 32-year-old from Merced, Calif. Chavarria, who began abusing drugs at the age of 12, was eight months pregnant at the time. Last August, she gave birth to drug-addicted twins, and California's Child Protective Services took the infants, as well as Chavarria's three other children, into custody. As with other addicts, the road to recovery for Chavarria began with counseling and a drug-rehabilitation program. Less orthodox, however, was her decision to undergo a tubal ligation. "Addicts in my situation need to get their tubes tied," she says. "When you stop having kids, it makes you think about what else you can do in life." Chavarria had the procedure done after meeting with Project Prevention, a North Carolina–based charity that gives drug addicts $300 if they go on long-term birth control or undergo sterilization. The aim of Barbara Harris, 57, the organization's controversial founder, is to prevent addicts from having children they can't care for and reduce the number of babies who are born exposed to drugs. 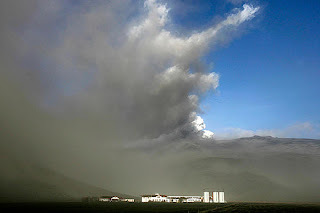 from public intelligence: Public Intelligence has received a request from FEMA to remove a “For Official Use Only” document regarding the National Level Exercise 2010 (NLE 10), which was scheduled for this coming May. The exercise was to be based on National Planning Scenario 1 which simulates a nuclear detonation in a U.S. city. However, recent political pressure has led to the exercise being “scaled back” according to the Washington Post, Christian Science Monitor and a variety of other publications. At the behest of Senator Harry Reid (D-NV), the exercise’s Nevada events have reportedly been canceled and the FEMA website now shows no mention of NLE 10.
from corbett report: Those who have studied history know that nothing invigorates and empowers an authoritarian regime more than a spectacular act of violence, some sudden and senseless loss of life that allows the autocrat to stand on the smoking rubble and identify himself as the hero. It is at moments like this that the public—still in shock from the horror of the tragedy that has just unfolded before them—can be led into the most ruthless despotism: despotism that now bears the mantle of "security." govt prepping you for 'domestic terror attacks'? 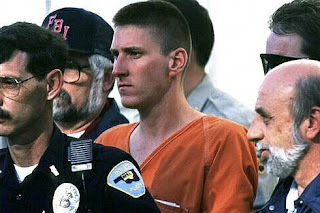 from paul joseph watson: Bill Clinton, the Southern Poverty Law Center and almost the entire corporate media are not letting a good opportunity go to waste today – by dancing on the graves of 168 victims & exploiting the 15th anniversary of the false flag Oklahoma City Bombing to demonize their political enemies, the Internet & anyone who dares to express dissent against the federal government. from clyde lewis: America has now been devalued. Prepare yourself for divisions of philosophies and the encouraged discontent to provoke a clash. There will rebellions, total strikes, transportation halts, and mass terrorist attacks from Americans that are worried about the future. Can you imagine food riots, gas wars, and mass arrests at rallies and protests because of information and actions that obfuscate the American people? As governments accrue more power to themselves, they seek out ways to expand and complete their control – and fear and dread secure the ideal atmosphere in which to enforce this type of mindless conformity. Prior to 9/11 the United States was a country that had a healthy suspicion of the policies of their government. There was investigation after investigation into wrong doing conducted by the state. 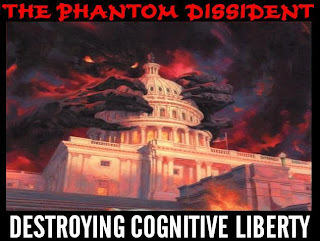 from corbett report: The Corbett Report is pleased to present the audio from the latest Jason Bermas documentary, Invisible Empire. This documentary breaks down and defines the New World Order and documents several key strands of this Invisible Empire, from the round tables and working groups to government drug smuggling, from the one world government agenda to the elite secret societies that govern politics from behind the scenes. If you enjoy this documentary, please support the filmmaker by buying a copy from Infowars.com or subscribing to PrisonPlanet.tv. from ap: America's "Great Compromiser" Henry Clay called government "the great trust," but most Americans today have little faith in Washington's ability to deal with the nation's problems. The survey illustrates the ominous situation President Barack Obama and the Democratic Party face as they struggle to maintain their comfortable congressional majorities in this fall's elections. Midterm prospects are typically tough for the party in power. 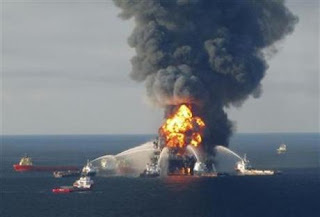 Add a toxic environment like this and lots of incumbent Democrats could be out of work. the last two weeks have been a dark time for west virginia. on april 5th, an explosion at the upper big branch mine in montcoal killed 29 men & is the country's worst mining disaster in 40 years. but the day before the montcoal catastrophe was easter sunday and a group of activist/artists converged on nyc bank branches where they 'deposited' mounds of murdered dirt from coal river mountain on the floors of atm lobbies. why? because we now know that the banksters at jpmorgan chase are behind 80% of the mountaintop removal in appalachia - and soon the rest of the world will know, too. 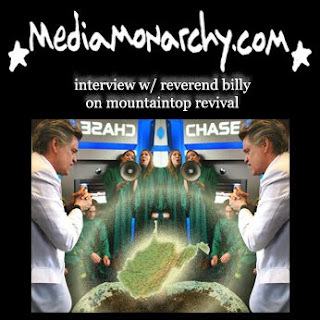 this very special interview episode from media monarchy features a rousing conversation with reverend billy of the church of life after shopping. we're here to inspire you to bring your own murdered mud to chase so that we can begin the rebirth of west virginia & join together in a mountaintop revival!